A couple of weeks ago, I was invited by my sweet friends at Restyle to try a product that they carry called Webster's Chalk Paint Powder. I had a dresser that needed a makeover and I had decided on black and gray. 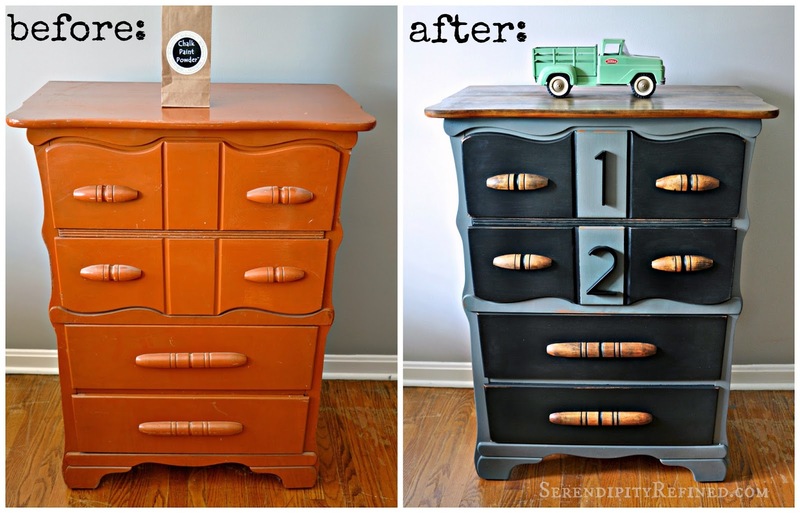 I wanted to use a chalk finish paint but I didn't really want to purchase two quarts of paint because I knew that I really only needed a couple of cups of paint or less. First, let me tell you that Webster's Chalk Paint Powder is NOT paint. What Webster's IS is a low cost, all natural, additive that can be added to any brand, any color of latex paint to turn it into a chalk finish paint. It can also be used to transform any brand of latex paint into a durable chalkboard surface that's great on walls and for crafting. Using Webster's meant that I wasn't limited to a couple of dozen colors. It meant that I could choose exactly the shade that I wanted and I could mix up as much or as little as I wanted to make. Note: For best results, Websters should be added to flat or eggshell finish interior latex paint. It doesn't work well with semigloss or gloss paints, paints that have a primer built in or an acrylic in them. I used Glidden sample sizes in eggshell finish for my project. The entire piece took about 3/4 cup of gray and 1/4 cup of black. Measuring and mixing this product was easy. I measured the powder and water according to the directions on the back of the package and mixed. 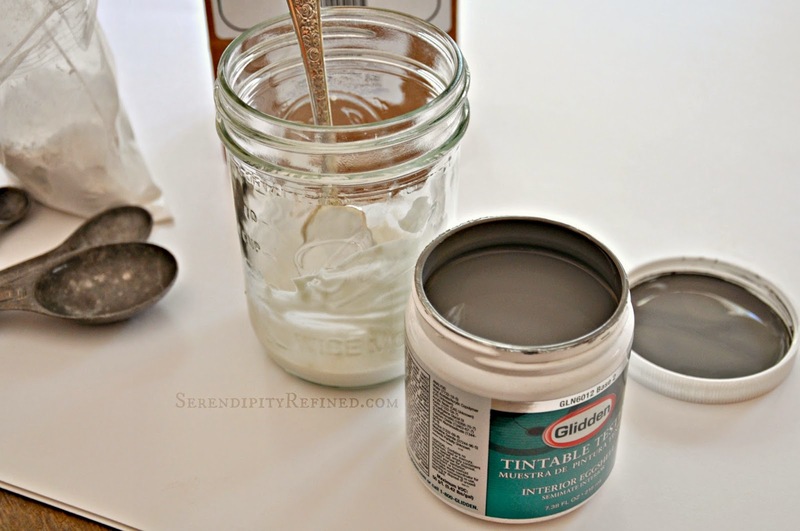 The powder mixed easily with a spoon and in under a minute was smooth and had no lumps or specs like when I mix milk paint and no need for a whisk or other tools. To be honest, this would have worked just fine with a paint stir. Then, I added the paint to the Webster's mixture and again mixed with a spoon. Mixing was easy, the result was a very smooth paint that had no lumps. This chalk finish paint mixture is thinner and more smooth than Annie Sloan but thicker and smoother than Milk Paint. 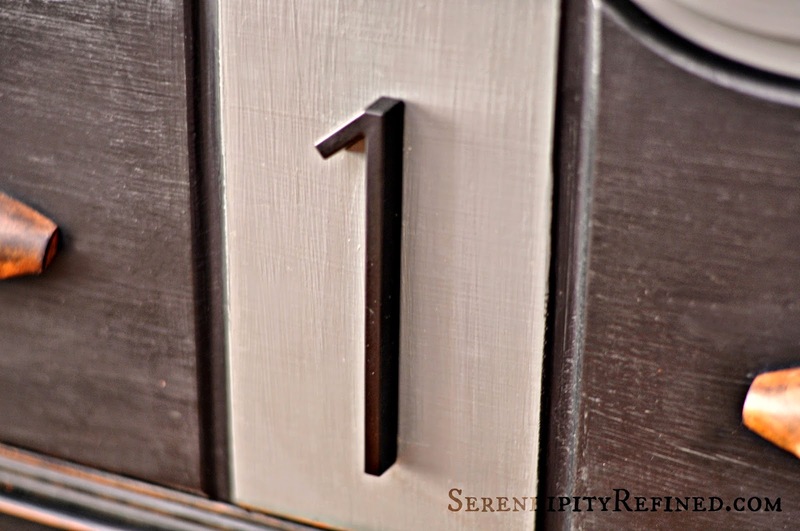 Webster's requires that the surface be clean and free of grease, grime and furniture polish. 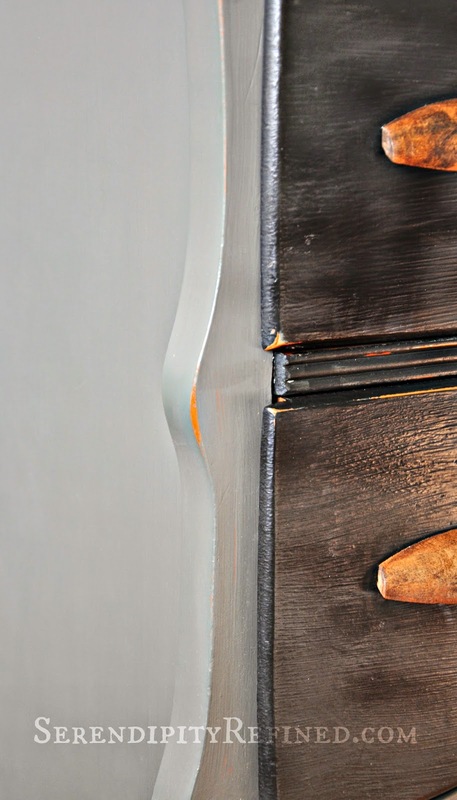 Although some products say that no surface preparation is needed, I know from over 30 years of painting furniture that the shinier/glossier the piece is, the less the paint will stick to it. Note: I've said it in prior furniture painting posts and I'll say it again: The finish on your piece will only be as good as your prep job. I always sand before painting. Whether I sand less or more is dependent upon the finish that is currently on the piece as well as the look that I'm trying to achieve. This piece was VERY SHINY so I sanded it with my palm sander using 150 grit paper. It only took one sheet. 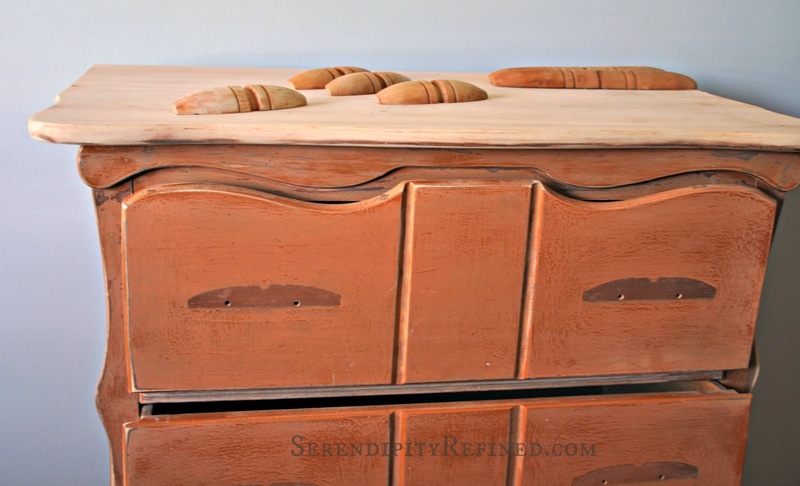 I sanded completely through the finish on the top of the piece as well as the handles because I knew that I was going to stain them and leave them natural. On the rest of the piece, I sanded just enough to remove the sheen. I finished the top and the handles using General Finishes Gel Stain in "Java" which I wiped on and then sanded using 240 grit paper to allow some of the original color to show through and so that it didn't become too dark. No special brushes are required for applying this product. 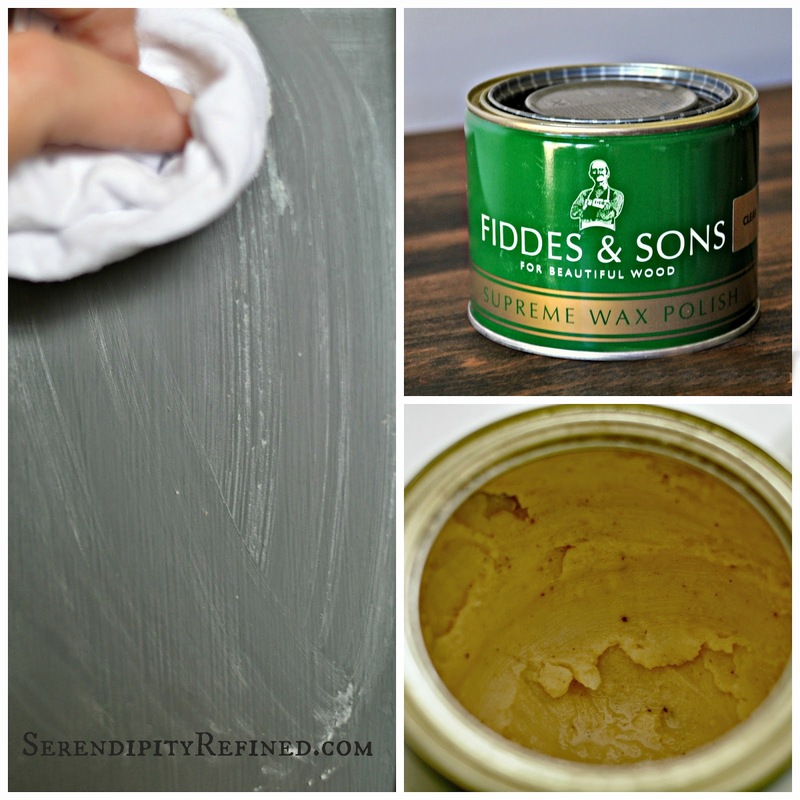 (A roller can be used for applying it to walls.) I happen to prefer natural bristle brushes and have several on hand but, in order to find out just how well this paint performs, I used the cheapest, lowest quality, "chip brush" that I could find. I think that it cost $1. The paint went on very smoothly and covered about 90% in a single coat. For very dark colors (over lighter surfaces) or very light colors (over darker surfaces), or if you want your piece to have a more uniform appearance, expect to apply two coats. Because the "base" for Webster's is latex paint, it takes slightly longer to dry than traditional chalk or milk paint products. The directions say to allow it to dry for at least 30 minutes prior to sanding and re-coating. That's not a problem for me because I tend to like my paint to be workable for a little longer but may be an issue if you're in a hurry. I single coated most of the piece but went back and re-coated the drawer fronts and the large side panels because I wanted the piece to have only very slight distressing and a fairly consistent finish. 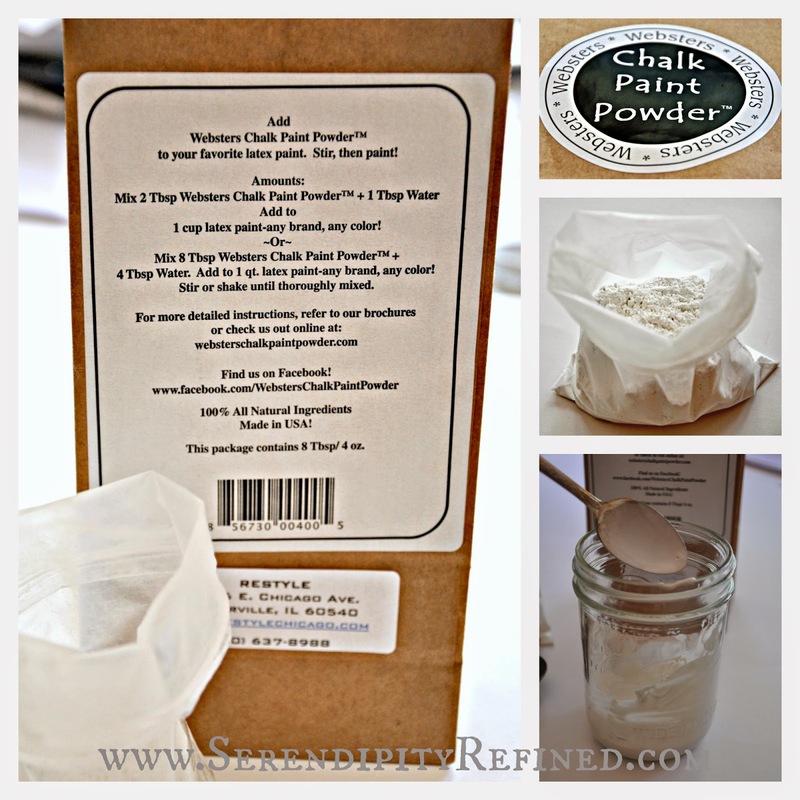 As with any chalk, mineral, or milk paint based product, paint which has been made using Webster's Chalk Paint Powder does require a finish of some sort (either wax or polyurethane) due to the porosity of the paint. Webster's recommends Fiddes & Sons wax polish and I used it on this piece. Fiddes has been around for nearly 100 years and is available in seven different colors. It contains an environmentally friendly blend of waxes that are Toulene free and low VOC. 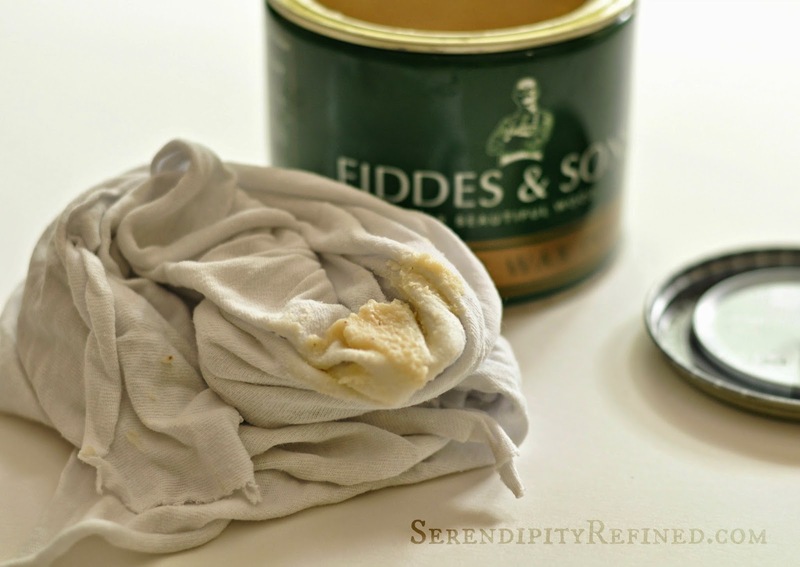 Fiddes wax can be used to enhance the beauty of stained wood and/or to create a protective top coat for chalk, mineral and milk painted surfaces. Note: While the literature states that the product is virtually odor free, I did notice a slightly wax-y smell while I was applying the product (in my 12 x 12 foot studio space with the windows closed). It was not a strong smell at all and I didn't find it at all unpleasant. I'll admit that I have a very acute sense of smell so there's a possibility that you may not smell anything at all. The smell dissipated quickly and was gone completely once the wax dried. I chose clear wax for this piece since I was applying it to both stained and painted surfaces. 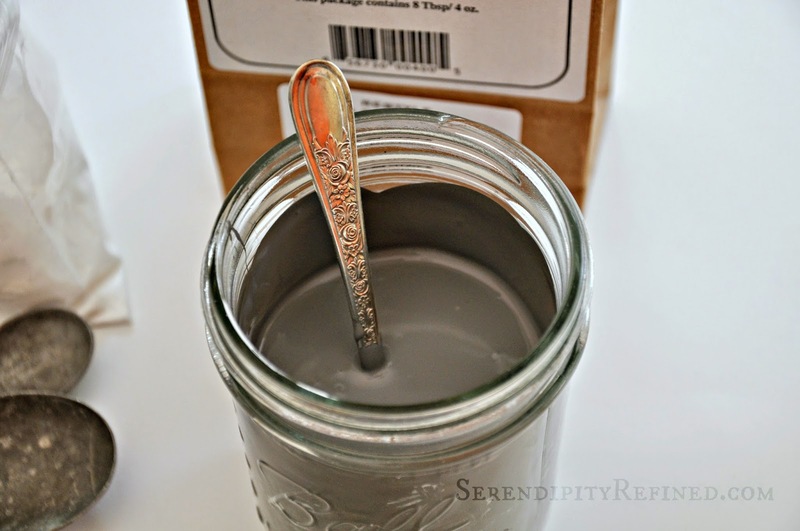 I found the was to be one of the softest waxes I have ever worked with (including Annie Sloan, Miss Mustard Seed, Minwax, Johnson, Briwax and Liberon as of the date of this post). It's super easy to apply by hand, dries enough to be buffed in about 15 minutes, and cures to a hard finish after about 48 hours. I applied it by hand with a soft cloth wiping in the direction of the grain of the wood where possible. I buffed (by hand with a clean soft cloth) after an hour, re-coated and buffed again. 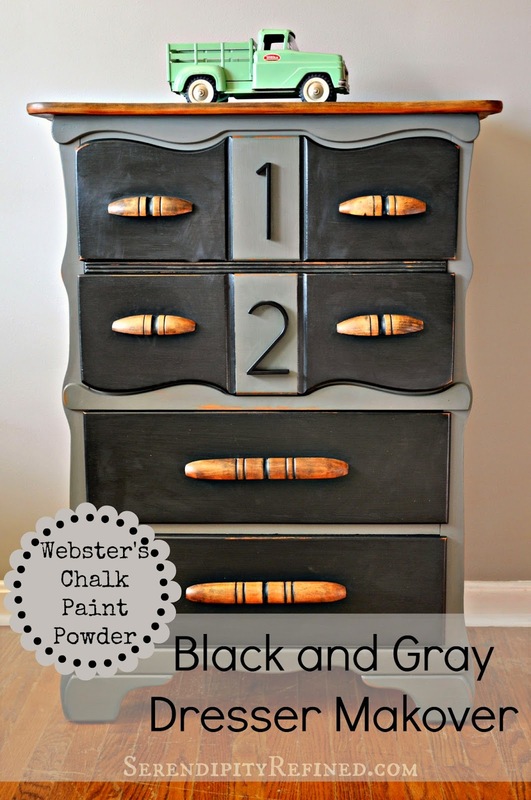 Webster's chalk paint powder was super easy to use for this black and gray painted dresser. It was far easier than mixing calcium carbonate or plaster of paris into paint (both of which I've done and used in the past). 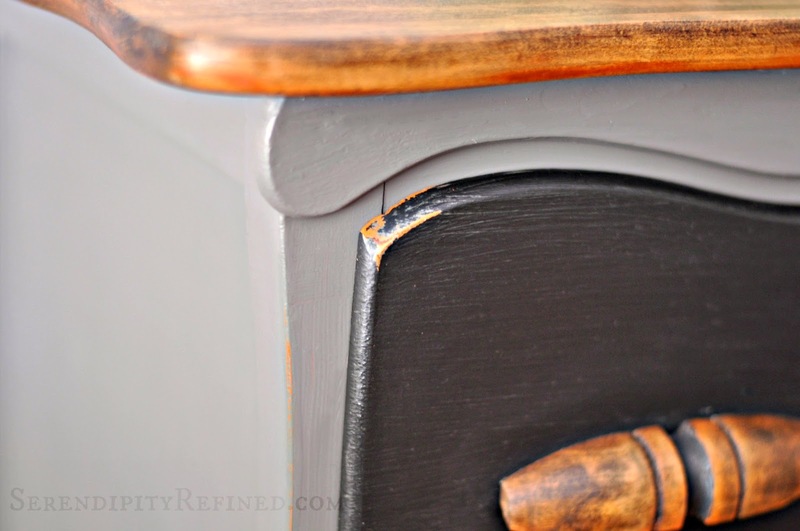 It provided a simple and inexpensive alternative to other brands of chalk paint and gave me the flexibility of choosing virtually any shade or color for my dresser. Fiddes wax was extremely soft and easy to apply and to buff. Disclosure of Material Connection: I received one or more of the products used in this post for free in the hope that I would mention it on my blog. I only recommend products or services I use personally and believe that you, my readers, will enjoy. I am disclosing this in accordance with the Federal Trade Commission’s 16 CFR, Part 255: “Guides Concerning the Use of Endorsements and Testimonials in Advertising.” This review is based upon my own use and experience with the product and I would always recommend trying the product prior to using it.